An important aspect of yoga is the subtle, but key practice of hand, body and eye postures, to invoke certain flows of energy and create certain states of consciousness, called yoga mudras. In last month’s newsletter I introduced you all to yoga mudras and provided 5 important mudras to start with. In the newsletter I also mentioned I would be creating a comprehensive guide to yoga mudras, and this is the first part of that guide. In this part I will provide the 5 hand mudras I gave in the newsletter and in the next part of the series I will illustrate and detail many more important mudras to help you take your yoga and meditation practice to the next level. What exactly are Yoga Mudras? Mudras are hand, body or eye positions that facilitate certain energy flows in the body and by forming these mudras you can induce certain states of mind and consciousness. 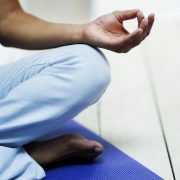 Many of the meditation and yoga techniques on this website utilize mudras and mudras are a key part of yogic technology. Hand mudras generally work by preventing the dissipation of prana (life-force) from the fingertips. 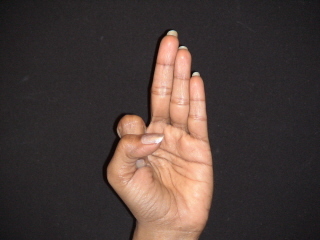 in order to do this, one brings the fingers together in various ways, which helps create certain subtle energy circuits. These circuits then channel prana along particular pathways to affect the mind/body complex in specific ways. Although their effects are subtle, the changes they produce can be sensed by those with refined awareness. Below you will find illustrations of 5 important hand yoga mudras and an explanation of what their benefits are. In the next part of this series, I will also detail eye mudras as well as give you many more hand mudras. Many thanks to the hand model for these pictures, my wife Trupti . Taken by bringing together the thumb tip and index finger of each hand. Other 3 fingers are kept extended. 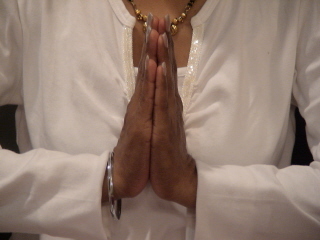 This is the traditional hand posture for Hindu meditations. Helps the mind go inward. Taken by placing the right hand over left (some prefer the other way around) with the thumb tips slightly meeting. The index finger and thumbs form a nice oval. This is the traditional hand posture for Buddhist meditations. The benefits of Cosmic Mudra are very similar to Gyan mudra as they are both used for meditation. Promotes the flow of intuition, insight and awareness. Helps silence the mind of thoughts. Taken by folding the index finger under the thumb. Other 3 fingers are kept extended. This is good for active techniques, specially active yoga breathing exercises. It is also good for some meditations. Promotes the flow of knowledge. Also promotes a meditative state of mind. Taken by bringing the palms of both hands together and pressing together gently. All fingers are together and pointing straight up. 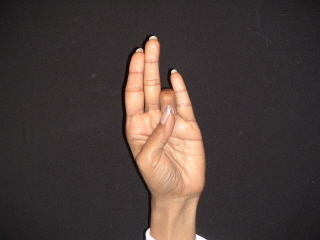 The traditional mudra for praying and greeting each other in respect in Hindu, Buddhist and other cultures. Namaste essentially means, “My Divine Aspect Lovingly and Respectfully Greets Your Divine Aspect”. Promotes humility and sense of respect. Creates a prayerful state of mind. Can be used to stimulate the Heart Chakra and also the Third Eye Chakra. Taken by bringing the ring finger and thumb tip together, while other fingers are kept straight. 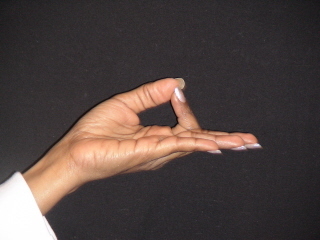 This mudra is used in yoga techniques and meditations that are very active and powerful in nature. 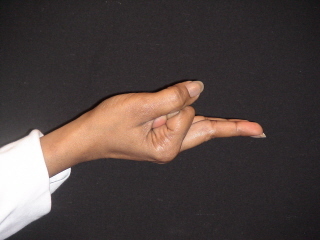 A variation to Surya Mudra is to place the ring finger under the thumb, instead of just having the tips meeting, which is how it is how it is illustrated below. Sir how long we should do each mudra? Daily how long a person can do mudras. Is there any time limite to do mudras. If a person do the mudras unlimited time, is there any loss to body. pl reply to above mail address. this is very useful to me………..
now i feel very silent in my mind………. I can get into stage 1 so far, combined with shambhavi it’s amazing! 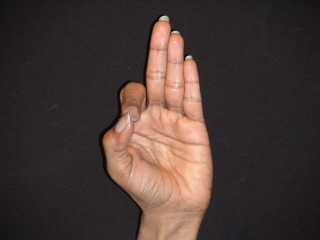 thank you for adding the Mudras, I am very interested in learning this hand yoga, this would be great for the handicapped and older seniors in wheelchairs. Thank you for this! So much infinite wisdom in the Asana and meditative practice. Hi Thanks a million zillion for such knowledge given to us..its indeed enriching our lives. Your words seems to come straight out of your heart & not the mind..which indeed touches the true seeker of knowledge. Thanks again. 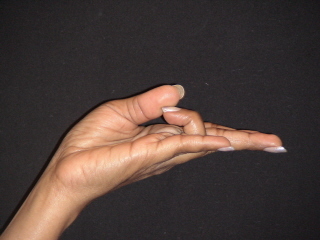 A question: Whats the best time to practise Mudras? What Care & Precautions should be taken? 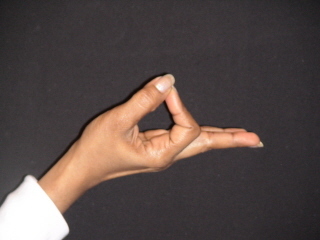 & For How long should one practise these Mudras?